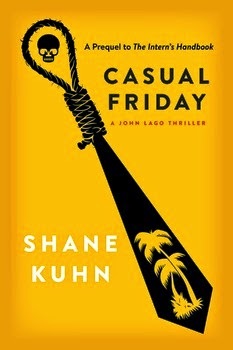 Casual Friday is the story of hit man John Lago’s very first assignment as a recruit with Human Resources, Inc., a placement agency that sends assassins, disguised as interns, to take out high-level targets under cover of corporate invisibility. John will go on to become the most successful “intern” in HR’s history. You can read more about his career in The Intern’s Handbook, a full-length thriller that will be published on April 8, 2014. The Intern's Handbook will be touring Freda's Voice in February! For the most part, I liked it. I hated the ending though. With a passion. I was enjoying the flow of the story. John Lago is quite the character, and he introduces the reader to a world we wouldn't otherwise know anything about. I liked how this story was a twisted take on that world. That definitely appealed to me as a reader. At the end, I think the author was going for dramatic. It didn't work for me though. I said out loud, 'That's it?!'. Then I shook my head a few times. Yup. I hope The Intern's Handbook picks up where Casual Friday abruptly left off. **No compensation was received for posting. Compensation will be earned if purchases are made from the links within. This copy was obtained for free. Opinions are owned by this site.